The Prime Minister of Samoa The Hon. 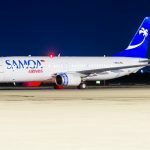 Tuilaepa Sailele Malielegaoi was the first VIP passenger welcomed at Brisbane Airport (BNE) following the evening arrival of the inaugural Samoa Airways flight from Apia yesterday. Heralding the commencement of scheduled services between Brisbane and Samoa, the direct Boeing 737-800 services, which will operate twice weekly during November-January and weekly from February to March, will further strengthen the lasting and cooperative relationship that currently exists between Australia and Samoa, adding 14,000 seats into the market each year. Gert-Jan de Graaff, Brisbane Airport Corporation (BAC) Chief Executive Officer, said BAC was committed to working with Samoa Airways to ensure the success of the service, explore market demand and provide more choice for travellers. 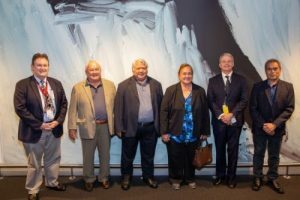 “Brisbane has the largest population of Samoan born people in Queensland, so these new flights help maintain strong cultural familial ties, providing choice and convenience, while saving time and money as travellers are no longer forced to travel via another port. “Samoa is truly the heart of Polynesia and a place Australian’s want to visit to experience the breath-taking natural beauty, authentic culture and the warm and renowned Samoan hospitality. “These new direct flights however will deliver so much more to both Queensland and Samoa, boosting business, education, health care and trade opportunities. “We warmly welcome Samoa Airways to the Brisbane Airport family and look forward to working with them to make the route a success,” Mr de Graaff said.